More than 300,000,000 miles through interplanetary space in 205 days so averaging 60,000 miles per hour. While to a certain extent planets are hard to miss because they are comparatively large and have gravity, the angle of approach requires considerable accuracy – much greater than 12 degrees and the lander will burn up. 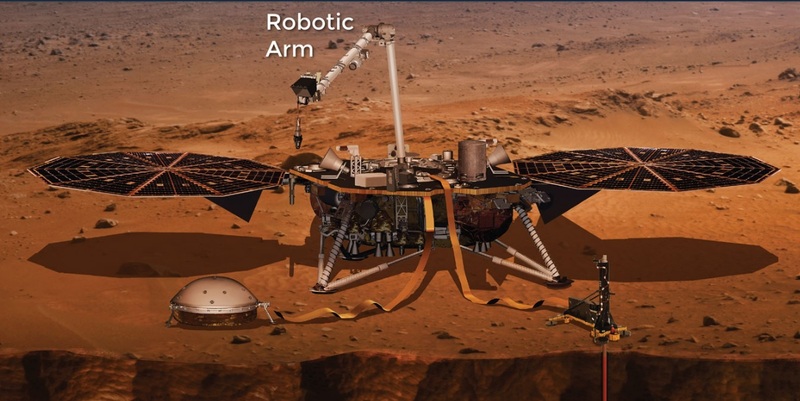 Much less than 12 degrees and the lander will bounce off the Martian atmosphere and wander off. Then there’s the problem of slowing from 12,300 miles per hour to essentially 0 miles per hour within the time it takes to fall about 70 miles. To slow the fall took precise separation of the lander from the cruise stage then a reorientation so the heat shield faces downward. ‘Heat shield’ is a pretty modest description for something that needs to withstand 3000 degree (Fahrenheit) heat especially since the more common varieties of steel melt at around 2500 degrees, nickel at 2646 degrees and wrought iron at 2700 degrees. There are some exotic metals with high melting points: Osmium, Rhenium and Tungsten, for example. The problem is getting enough material (the heat shield is over 100 inches in diameter and almost 130 pounds) and shaping it into a heat shield. In this case the technical description is “spherically-blunted 70-degree half-angle cone makes use of Lockheed Martin’s Super Lightweight Ablator (SLA) 561V Thermal Protection System material”. The principle behind an ablative heat shield is protecting the spacecraft structure by allowing the heat shield material to slowly burn away in order to create a boundary layer of colder gas in between the extremely hot shockwave layer of crushed gas and plasma and the spacecraft structure in order to protect against all forms of heat flux. Then the lander needed to deploy a parachute, discard the heat shield (so as to not land on it), get out of the way of the falling heat shield (so as to not have it land on the lander), fire the retro rockets, stop firing the retro-rockets, have all the legs deploy and actually touch the surface (gently) at a reasonably flat (=level and rock-free) place. Everything had to survive six months in space and then a plunge through the admittedly sparse atmosphere of Mars. Because the transmission time is eight minutes (one way) all this has to work without human intervention.